Cora "Dot" O. Schemonia, 85, formerly of Pomona, went home to be with the Lord at 7:39 p.m. Friday, October 5, 2018, surrounded by her children at Memorial Hospital of Carbondale. Cora was born on December 23 1932, in Jackson County, Illinois, to William Baseden and Eunice (Sprouse) Baseden. She was a homemaker and she made yarn and canvas signs. She also enjoyed word search puzzles. 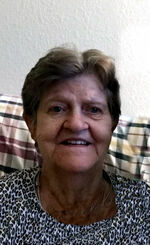 Mrs. Schemonia was a member of Dutch Ridge Baptist Church in Pomona. Dot married Glenn Schemonia on August 15, 1950, in Murphysboro, and he preceded her in death on June 1, 2017.
and one sister Betty Weston of West Plains, MO. She was preceded in death by three sons and one daughter in law Chuck and Alice Schemonia, Kenny Schemonia, and Jimmy Dean Schemonia, one daughter Nancy King, one son in law Butch Pinkston, two great grandchildren, five sisters, four brothers, and her parents. Funeral services will be held at 1 pm. Monday, October 8, 2018, at Pettett Funeral Home with Rev. Carl Dillow officiating and burial at Jerusalem Cemetery. Visitation will be from 11 a.m. to 1 p.m. at the funeral home. The family would prefer memorials made to Jerusalem Cemetery. For more information, please visit http://www.pettettfuneralhome.com.